Some qualifiers are needed here. These are my favorite photographs that I took with my Nikon D3200 while hiking this year. I’m very much an amateur photographer, but I’m looking to take it more seriously and improve my photographs. I thought a good way to do that would be to look back on this year’s photographs and single out some for inspiration and as a benchmark for 2015. This photo is from my first hike with my new camera. 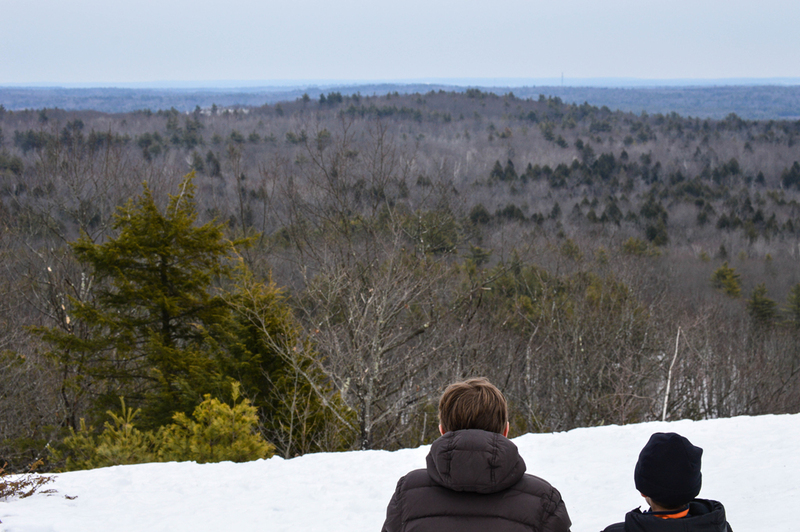 My boys and I climb Bradbury Mountain every year. It is the closest mountain to Portland, Maine, and although it only rises 485 feet, it is enough to afford a view of the nearby coast. I snapped this shot while my boys were quietly looking toward the coast. The mountain was covered with ice so the boys descended the mountain by glissading the whole way down. I love that this photo captures my boys in a moment of serenity. Prior to hiking Welch and Dickey Mountains my sons, my friend John, and I stayed at Hancock Campground off the Kancamangus Highway. I got up first thing in the morning to meditate by the river and took this shot. It is early May so the river is running high and hard. The photo is framed by a stack of stones that someone else had set in place. In the background is the Kancamangus Highway and beyond it is the suspension foot bridge at Lincoln Woods Visitor Center. 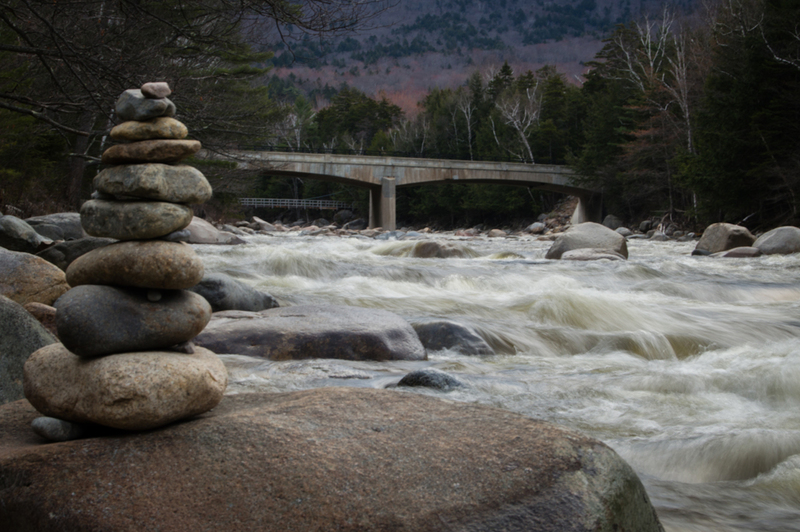 I love the juxtaposition of the balancing rocks and the motion of the river. 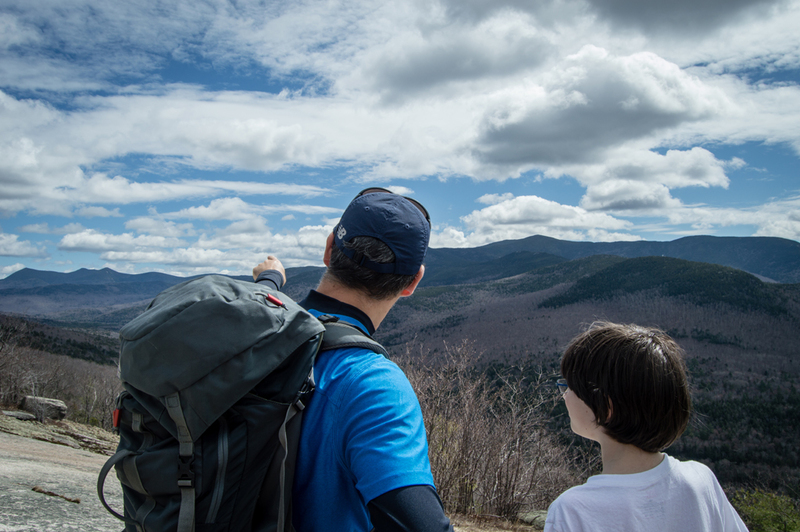 My friend Mike is pointing out some of the peaks in the Sandwich Range to his son. This is captured on the ledge vista below Welch Mountain. I love how the sky and clouds pop in this photo and how a fatherly moment is captured here. 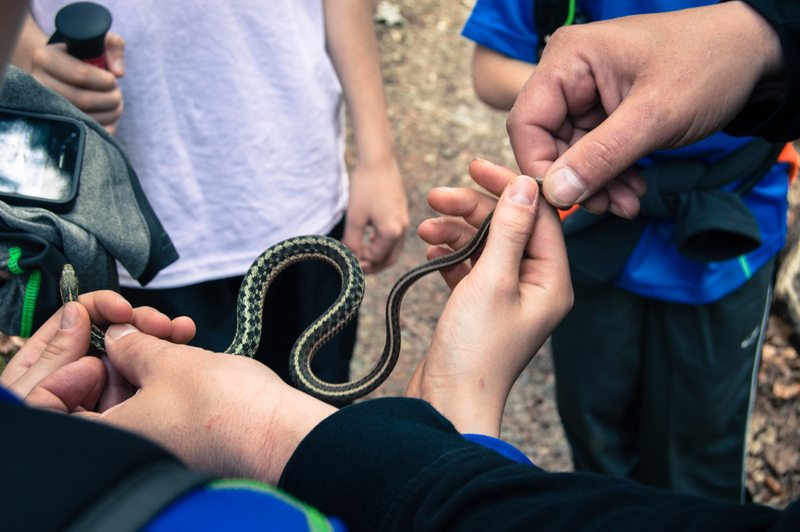 While hiking up Welch Mountain my friend John leaps into the brush and comes forth with a garter snake. I took this photo as he passes the snake around to my friend Mike’s and my kids. I love the handing off of the snake as it shows a moment of education and respect of nature. I also love the curiosity of the other kids while they watch. 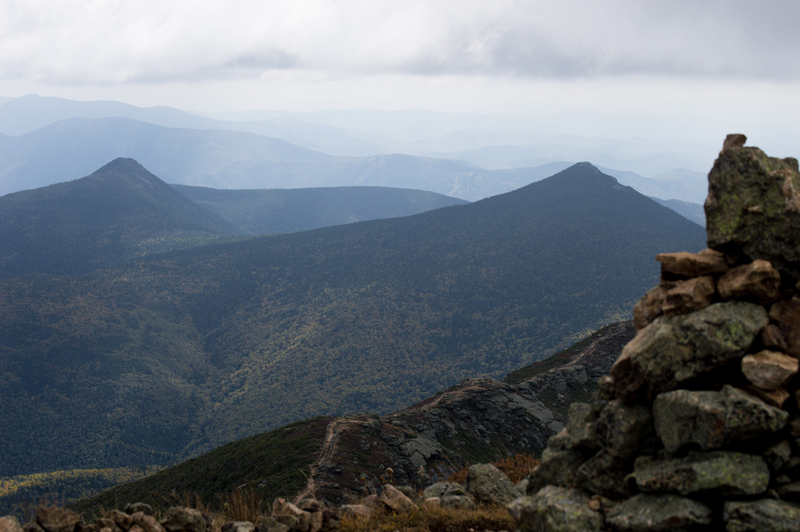 The Franconia Ridge Trail is one of the most amazing hikes in the northeast. I captured this photo while hiking Lincoln and Lafayette with my good friend and fellow photographer Branden. In the background are the wave-like peaks of Mount Liberty and Mount Flume. Closer to the foreground is the Appalachian Trail following the ridgeline. I love the layers of this photograph and then noticing the trail running across the ridge. 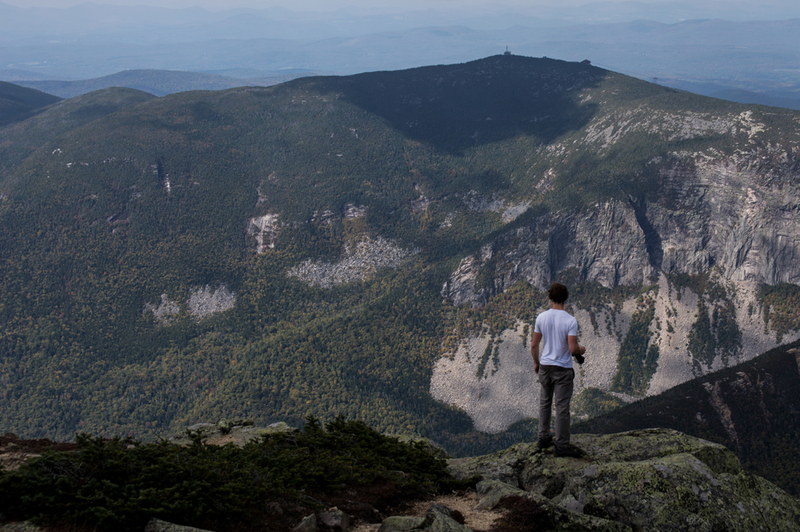 To me it captures how astounding Franconia Ridge is. 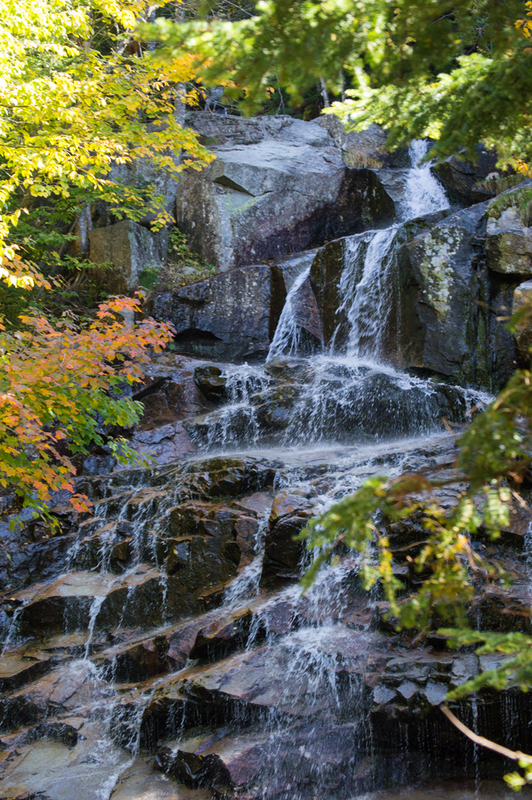 While hiking up the Falling Waters Trail toward the Franconia Ridge Trail I shot this photo of a waterfall. I love how the dark colors of the wet rocks are framed by the bright colors of autumn leaves. 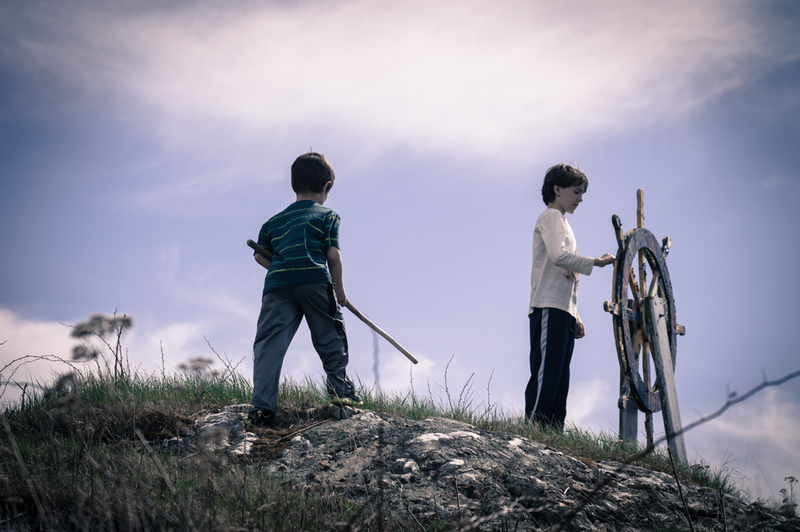 While going on a coastal hike around our home town of Long Island, Maine, my boys and I stop so they can play with a captain’s wheel set up near the rocks. I am down on the rocks looking up toward them and capture the shot through the weeds, with the bright blue sky in the background. To me this photo captures a moment of childhood daydreaming. If you know me, then you know I’m obsessed with the White Mountains National Forest and in particular the Presidential Range. 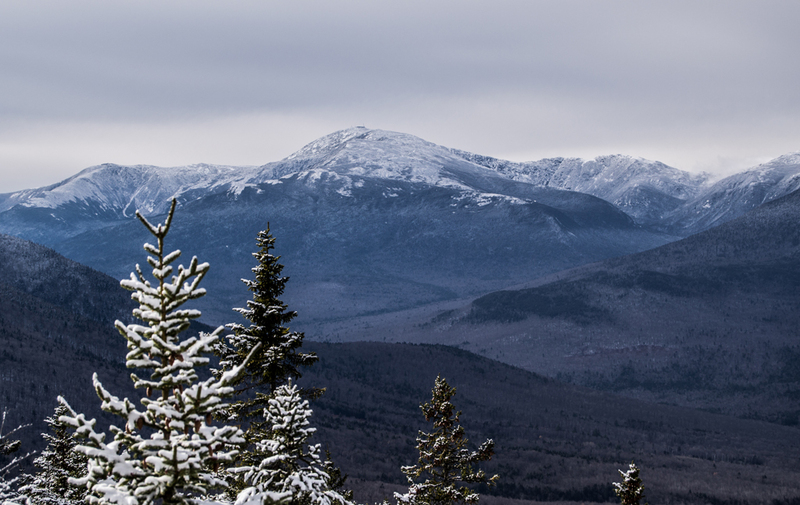 I love this early winter photo I took of Mount Washington from Mount Surprise while hiking to Mount Moriah. I love the details that the snow brings out on the mountain above treeline. I took this photo from the summit of Mount Moriah this November. 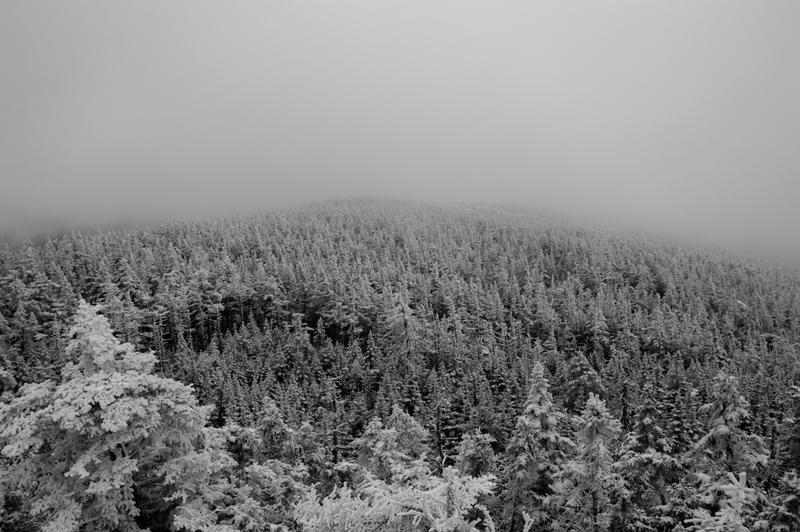 The snow covered trees were all I could see as the peak was sitting in a cloud. I made this photo a black and white as those are the primary colors anyway and it adds to the feeling of solitude. I took this photo of my photographer friend Branden on Little Haystack Mountain while hiking the Franconia Ridge Trail. I love that this photo captures his awe of the view and how the massive Cannon Mountain seems to be drawing him toward the Franconia Notch below. I also like how you can see the ridge that the Old Bridal Path follows in the bottom right corner of the photo. That point in the hike was several miles and hours away but seemingly right in front of us. I think I’ve learned a lot about photography this year, and the practice of revisiting my photographs in order to write this post was insightful. As much as I love to photograph scenery, the photos tend to be more interesting if they are capturing people enjoying that scenery. Also, I noticed how few of my hikes I brought my camera on, relying on my easily portable iPhone for photographs instead. Late in the year I discovered I could carry my Nikon in my daypack by putting it in a small drysack rolled tightly as to create a cushion of air around the camera. I hope to bring my Nikon on more adventures in 2015. “D3200 Nikon HDSLR Camera.” nikonusa.com. Nikon Inc. Web. 26 December 2014. This entry was posted in Hike, Photography and tagged Hike, Photography. Bookmark the permalink.